Paperback, with flaps, 384 pages, 13.5 x 20.6 cm, 5.3 x 8.1 in. Düsterbusch is no place for heroes, a backwater in East Germany, on the edge of the Spreewald forest. Anton lives here behind the junk yard for combine harvesters and his dreams are about living life to the full. Then he has a brilliant idea: his village must become a metropolis, with a metro connection and neon signs. With a handful of friends and bang in the middle of East Germany he sets about starting a trend-setting club just like in London. 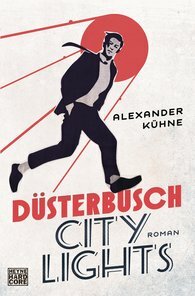 Alexander Kühne tells the story of someone who stays and fights – not politically but with the weapons of pop culture. He tells of mini-size grand dreams and the failure of a utopia. "An odd pleasure. (...) Tristesse oblige – a very different, and very crazy, East German novel."